The HD 535DSP is an open dynamic hi-fi stereo headphone for the discerning listener. The lightweight aluminium voice coils of the transducer systems give an excellent transient response. The clear tonal quality provides for an excellent reproduction of the sound stage. I got these from my dad, 5 years ago - who bought them about 10 years before that. I really love these headphones, new Sennheisers struggle to compete. There is a lot of wear and tear on the headphones but the speakers are still perfect, I had tol replace the cable which cost me like 40$ ( I replaced it with a better cable ). I run these with an old Technics Su 500 ( back when they were still great ) which I also got from my dad, the amp is about 25 years old. I am amazed by the fact that these are so old but still rocking any sound I give it. I have several headphones and reference monitors, and my HD535's provide the best results for mixing. These are not GOOD-sounding headphones; they are ACCURATE-sounding headphones. They will only sound good if the mix is good, which is a good thing because they reveal flaws in the mix. I am ordering replacement cushions, as I have used these so much that I am wearing them out. I've already been through a replacement cable. Since these are no longer in production, this advice doesn't matter: if you want headphones that make everything sound good, look somewhere else. If you want headphones that accurately reproduce the mix, this is what you want. I had a typical high-street £20 brand headphones before buying this. One day I got curious and walked into a proper hi-fi store and, after grinning from ear-ear at the Sennheiser listening post, walked out with the £80~ HD535. It was the best thing I ever heard for the price. The music reproduction was so accurate. A popular track in my favourite genre was Sound of Blackness' 'I believe'... the HD535 delivered the bass, mid-range weight, vocals and top end - all at low and (very) high volume. Simply it was like strapping hi-fi speakers to one's head. A keyboard/pianist myself, I've also mixed and produced with them and they quickly became my cans of choice. As one reviewer said, 'just don't move your head'. My HD535 soon developed a short in the one ear that remained even after replacing the lead. It's a lot worse now and I will soon replace the headphones altogether with the HD555 which, at first listen, lacks the top-end of this pair. Basically wonderful sound, but lead connection problem within the HD535 lets it down. 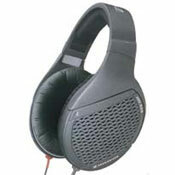 Did send off HD535s to Sennheiser via store to remedy shorting out. It didn't work and I'm now aware that it was/is a prevailing problem. So I'm disappointed that they did not replace the headphones altogether. Vivanco SR750 (£60 in 1996) bought as back-up and reference... a more contained sound, holds back and is much harder to drive. Velvet ear-pad is very comfortable and my ears are used to its EQ levels now. It's my main-stay headphones but I am so looking forward to receiving my HD555s. Comfortable, good tonal balance with supple bass and crisp treble. Crackly audio lead on one side. I purchased these headphones as I wanted to be able to apreciate my music without disturbing the neighbours. I always heard that Sennheiser were good. The headphones are very comfortable, sitting on the head snugly and isolating me from the outside quite well. The sound quality is good, balanced with the ability to handle high volume levels without distorting, particularly at the bass end. The thing that immediately bugged me was the crackling audio connection on the right hand side. This never went away but I could never be bothered to take the damn things back. I still use them but have just ordered a replacement audio lead. Hopefully that will resolve the problems. well, i'm very happy with this headphone set ...when i had it for a year the cable did distort the sound...it wasn't strong enough..when i went back to shop (after more then a year) the immediately gave me a new cable! now few years later i haven't seen any probs . i'm very happy with it...also in the shop they say it has lifetimewaranty on cables plugs and the soundboxes in there...haven't seen 1 brand giving the same waranty..only that deserve a positive remark. and yes also mine was abused loads of times. Well . . . none to me. I never did really like these. The sound was good --- never amazing like the Bose Triports. With the Triports, it was love-at-first "note." Anyway, the treble and mid-range are standouts, like other posts mention, and the bass is shallow, like the posts mention. The thing that made me hate them was the faulty cord connection. One channel just wouldn't stay put. The cable was so "flimsy." Also, the cushion around the phones smashed horribly and lost their shape in a year or so, and then tore. Hmmmm. To me, none of Sennheiser's headphones are any good. And they are supposed to be a headphones authority. Sony is good. Bose rules. dual cords, rather than single left ear input perhaps not as much bass as some headphones i've tried, but I'll glady give up some bass for EXCESSIVE clarity anyday...These can's are perfect to my ears. I love them!!!! There are no cans to compete with these that I've yet heard. They don't have tremendous bass, but instead of trying to sound like a jukebox you get the open aire sound that makes you think you're listening to $10,000 loudspeakers. I've owned about 10 pairs of headsets in my search for a pair that can match my tastes...The Sennheiser HD535 are standalone the best headphones I've ever heard. They sound brilliantly clear, and somehow even beat out the hd-570, which sound muffled and distort easier at lower volumes. I cannot give these headphones enough praise and I've been around the blocks in headphone trials. Great sound and surprisingly rugged. Replacement parts, although a good option to have available, are quite expensive. Have a great sound, fidelity and clarity, good for Djs, Musical Intruments, Mp3 Players and All! Comfortable and excellent sound quality! They fit around my ears and are light weight. Lots of sound leaks to the surroundings. So if you like to listen to the music loud, it might not be a good idea in a work environment. I spent a lot of time working on the computer so I wanted headphones I could wear for 5 hours or more with comfort. Before settling on the HD 535 I tried using the Sony MDR-V700DJ, but found they grew uncomfortable after only an hour. These not only are comfortable but for a casual listener like myself, provide great sound. Even the bass is remarkable for such price.